Mohawk Self Insurance (MSI) is a community based workman’s compensation program for Kahnawà:ke companies and organizations. Businesses and organizations must be covered by MSI within the Territory, as it is replaces CNESST. 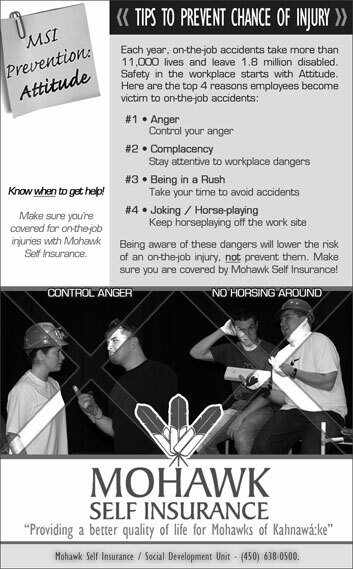 Offered through the Kahnawà:ke Labor Office of the MCK, MSI aims to provide a better quality of life for Mohawks of Kahnawà:ke by ensuring that all entrepreneurs provide proper insurance coverage for their employees in the event of an on-the-job injury and/or an occupational disease. There is no charge to the worker; it is the responsibility of the employer. All premiums will continue to be paid to MSI for all your workers (Kahnawà:ke & Quebec), your establishment will pay the same premiums, however subject to change in April 2018 depending on your claims ratio (this is standard). As of January 1, 2018, all workers will make their claims to CNESST and they will be serviced and compensated by CNESST directly. All Kahnawà:ke workers will make their claims to MSI. You do not pay premiums to CNESST. CNESST should NOT be contacting you, nor should they be sending you assessment notices, however if they do, please contact our office immediately and KLO will deal with it and remedy the situation. Please Note: All Quebec workers must access services through CNESST. Please click here. Registering your business is an easy process, the company owner completes and signs the MSI A Registration form and hand delivers it to the KLO Office Manager and Support. MSI will create a $100.00 deposit invoice; the company owner makes payment at the main MCK building and returns the payment receipt. Your company/organization is registered and employees covered from that day forward. The KLO Office Manager and Support will send an e-mail with all the necessary documents. As an Employer, it is your responsibility to maintain a workplace that is free of unsafe conditions, and you are responsible for following all safety and health standards and regulations. You are also responsible for ensuring that your employees comply with the same rules, standards and regulations. 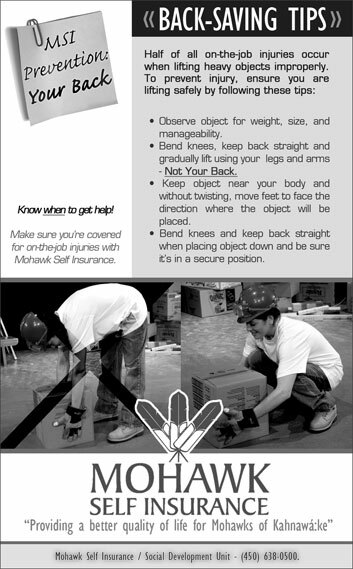 Workers are required to follow the established safety regulations and report unsafe working conditions to their employers. Employers misrepresenting the salaries of employees to again save premium costs. Kahnawà:ke has signed an inter-governmental labor agreement with Quebec where the community of Kahnawà:ke, through MSI, has gained full authority for its workers compensation on the territory (instead of CNESST). As such, this program is self-sustaining with no Federal or Provincial funding supplied. The costs are covered through contributions made by employers. It is important that employers provide this protection for their workers just as they protect their valuable assets such buildings, equipment, and vehicles. Fraudulent claims made by workers or employers betray the trust and financial integrity of the community as well as the contributions made by all employers contributing to the program. If you know a worker or employer who may be committing fraud, contact the Kahnawà:ke Labor Office at (450) 632-9595. 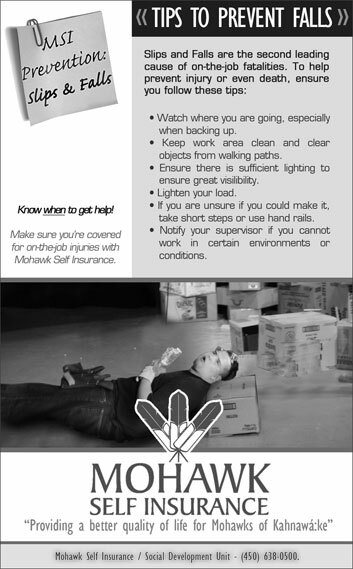 A work-related accident is when the injury or disease which occurred or from which the worker is suffering in the result of a sudden and unforeseen event during the course of employment or, in certain circumstances, while they were performing duties related to their work. A pregnant worker may be eligible for benefits from this MSI program if her working conditions endanger her health or that of her unborn child. It must be clear that a physician has identified an approved danger, as this program is not a leave but a preventative program. She will receive MSI benefits until such time as she is offered a safe job by the employer or 4 weeks prior to giving birth. If you are not eligible for QPIP, MSI will continue paying you the indemnity until the date on which your child is born. You must send MSI the letter from QPIP specifying that you are ineligible for QPIP benefits. The MSI Program also includes a Return to Work Program. The goal of the return to work program is to provide a uniform return to work process for participants covered under the Mohawk Self Insurance on the Job Injury Program. Once medical evidence confirms that the worker is ready to return to regular work, graduated return to work or modified work, the worker is admitted to the return to work program. The Mohawk Self Insurance Claims officer will work with the worker, employer and treating physicians to facilitate a return to work. This will involve communicating with the worker, treating physicians/practitioners and the employer to secure information regarding updated medical status and return to work information. The return to work program encompasses the restrictions, the accommodations, as well as the proposed work schedule for the injured worker once the worker is fit to return. 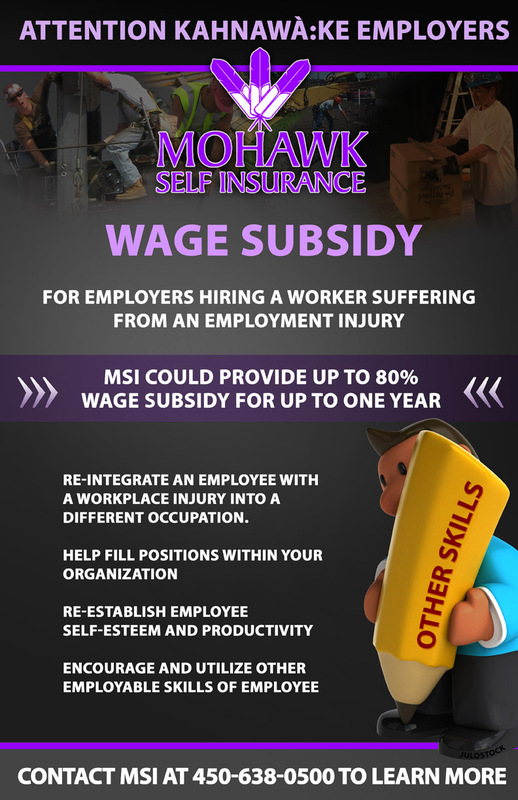 Mohawk Self Insurance provides a labor market re-entry program for a worker who cannot go back to her/his position as a result of an injury, this will enable the worker to re-enter the labor market and reduce or eliminate the loss of previous earnings in the employment or business that is suitable for the worker. Mohawk Self Insurance works with Tewatohnhi’saktha or other qualified agencies to perform an assessment and re-train the worker. This consists of three types of assessments: transferable skills, vocational and psycho-vocational. This assessment also assists in determining potential future economic loss. Benefits to replace lost future income will be available to workers permanently injured. It is not the responsibility of MSI to provide or find the worker a job; MSI will assist the worker as much as possible. After completion of any training, MSI will continue paying the weekly indemnity for up to (1) one year after graduation. The main purpose of this program is to re-integrate an employee who has suffered a work related injury, but cannot return to his/her original occupation. It assists in re-establishing his/her employability into the work force, it assists an employer to fill positions within their organization, it re-establishes employee self-esteem and productivity.